Meatloaf Meatballs are bite sized appetizers that have all the flavor you love in a classic meatloaf recipe. 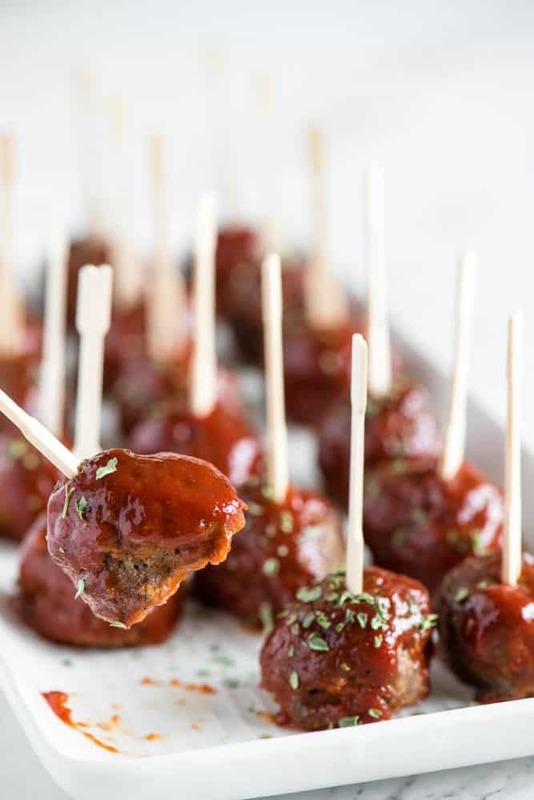 Our family loves meatballs and they make such a great party appetizer. You can also try Easy Teriyaki Meatballs, Porcupine Meatballs, or make these Swedish Meatballs for dinner! Everyone loves meatloaf. It’s a favorite dinner recipe across many American homes. That’s why I wanted to transform my super delicious meatloaf recipe into bite sized appetizer portions! Why should meatloaf only be enjoyed at dinner? It should most definitely be a party appetizer too. In addition to wanting an appetizer that I knew everyone would love, I had one more motivation for turning my classic meatloaf recipe into a bite sized tasty treat. The sauce. I can never seem to get enough sauce with my meatloaf and I always want an end piece because the outside is more crispy. The meatball tackles both those issues! 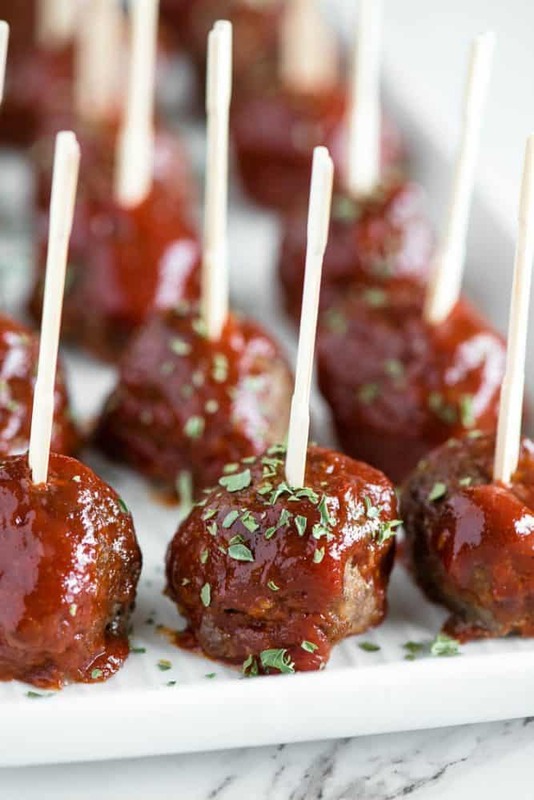 They’re so good, in fact, that next time I plan to make meatloaf for dinner, I’ll be making these meatballs instead! One of the reasons these meatloaf meatballs taste so good is because the first step is to saute up some diced onions. Raw onions pack too much of a punch but you still want the flavor, so sauteeing them is the answer! Once those cool you mix them together with the rest of the ingredients. To bake the meatballs, you’ll want to line a baking dish with parchment paper. It makes for easy clean up and prevents sticking. I actually like to use a cookie dough scoop to measure my meatballs before I roll them. That way they all stay the same consistent size. Do your best to roll a nice round shape without overworking the meat. Then, just pop them into the oven! When the plain meatballs are cooking, you’ll want to mix up the sauce. This takes like two minutes, so don’t stress. Now here’s the secret to a tasty sticky coating. About two thirds of the way through the cooking process, you’ll take the meatballs out of the oven and coat them in the sauce. Then, back into the oven they go! This makes the sauce set and really stick to the meatballs. Can you make meatloaf meatballs ahead of time? Yes! I prefer how they look set out on a platter with toothpicks for easy eating, but we all know that sometimes party food just needs to be easy. To make these meatloaf meatballs ahead of time, just follow all the cooking instructions and then keep them warm in a slow cooker. Trust me. Next time you go to a potluck, bring a batch (or two or three) of these meatloaf meatballs and watch them disappear. The only competition they might have would be against the deviled eggs! Preheat oven or grill to 350 degrees F. Line a baking sheet with parchment paper for easy clean up. Melt butter in saute pan over medium heat. Cook onions until fragrant and slightly brown while stirring occasionally, about 3-5 minutes. Reduce heat to low and add garlic, cook for 2-3 minutes. Remove from heat and set aside to cool. In large bowl, combine ground beef, egg, bread crumbs, milk, Worcestershire sauce, thyme, salt and cooked onions and garlic. Use hands to mix well, but try not to over work the meat. Shape into 1-2 inch sized balls on parchment lined baking sheet. Bake uncovered in the preheated oven 20 minutes. While meatballs are cooking, combine ketchup with mustard and brown sugar in a bowl. Set aside. 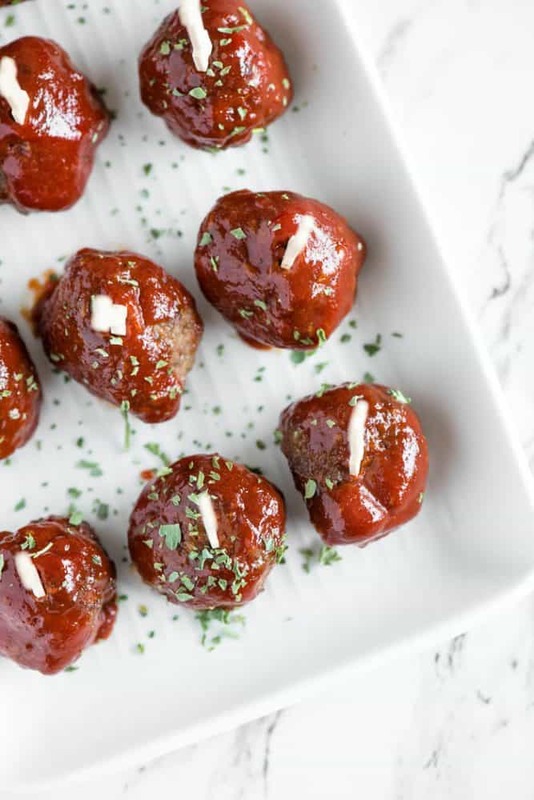 After 20 minutes of cooking, dip each meatball in ketchup mixture, return to baking sheet, and continue baking for about 10 additional minutes. Serve warm with toothpicks for easy eating. Can be kept warm in slow cooker, if needed. Baked Ham is one of our favorite holiday meals for Easter, Christmas and beyond! My kids much prefer glazed ham to turkey and I love that it’s so easy to make! 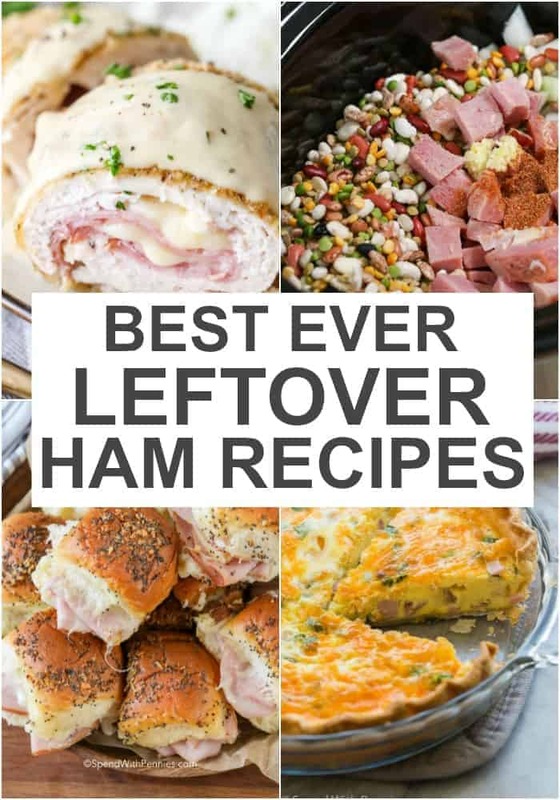 Ham takes very little prep work (especially if you Cook a Spiral Ham) and as much as we love a ham, we love the leftovers almost more! 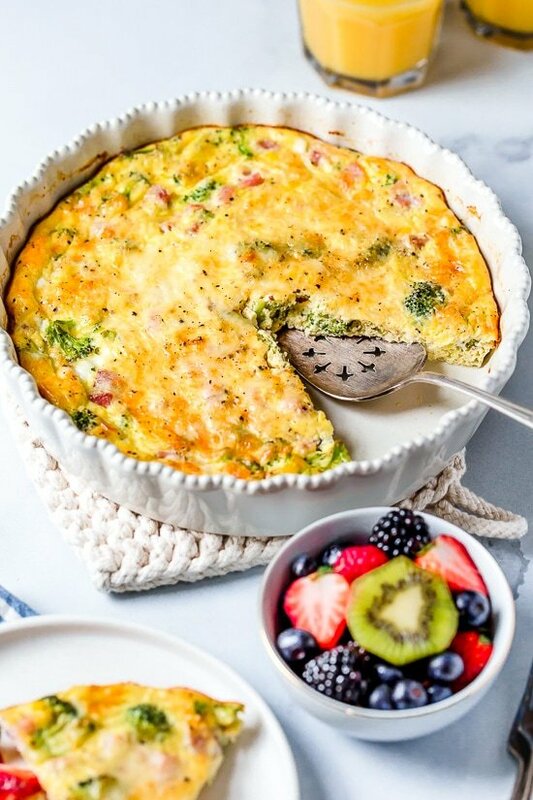 The uses for leftover ham is endless, it is perfect for any meal of the day from breakfast to dinner and reheats beautifully! 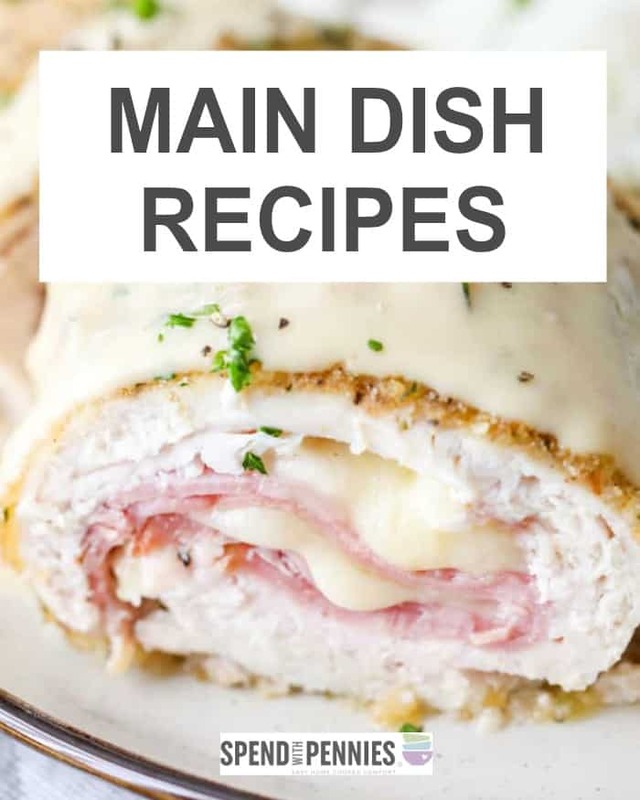 Below find our favorite ham recipes from soups and chowders to casseroles and sandwiches! Are you wondering what to do with leftover ham? Below are our favorite leftover ham ideas for the days after the big feast! To Reheat Leftover Ham: One of the best parts of a big meal (like a baked ham dinner) is that you don’t have to cook for a couple of days after! We start by just reheating leftover ham slices and eating it as is. Reheat leftover ham covered in a 325°F oven (I usually add 1/2 cup or so of broth to keep it moist) until heated through. This will vary based on how your ham is cut (and how much ham is in your dish) but slices will take about 25 minutes or so. Keep in mind your ham is already cooked so you just want to heat it, not cook it! If you’re having it for breakfast, you can also reheat the ham slices in a frying pan with a touch of oil or butter. Top with poached eggs and voila! As for what to do with the leftover hambone… it’s great for ham soups or to make a flavorful ham broth. So exactly how long does cooked ham last? It’ll last a few days in the fridge or longer in the freezer. I package it into 1 cup portions to make it easy to use in recipes! If you have a ham bone, it makes great soups and I usually just stick it in the freezer and then use it right from frozen! Fridge: Cooked leftover ham (spiral or other) can be kept in the fridge 3-4 days. (This also includes leftover sandwich meat ham once opened). If you’d like to keep it longer than that, I’d suggest freezing it. Freezer: Leftover ham should be well sealed (vacuum sealed is best if you have a sealer) and the leftovers can be frozen for up to 2 months. Ham is great in almost all soups, stews and casseroles in place of chicken or other proteins. We love to add it to pastas, rice casseroles or other dishes for a flavorful smoky taste! One great thing about leftover ham is that it can be eaten either hot or cold, sliced, diced or chopped. Anything goes! Top a salad with it, add it to your favorite pasta salad recipe, sandwich it in the middle of your favorite grilled cheese. The possibilities are endless! Using your ham bone to make broth adds so much flavor! We usually choose a nice bone-in ham just for that reason! Leftover diced ham holds up well to the crock pot and is a flavorful addition to soups and stews! 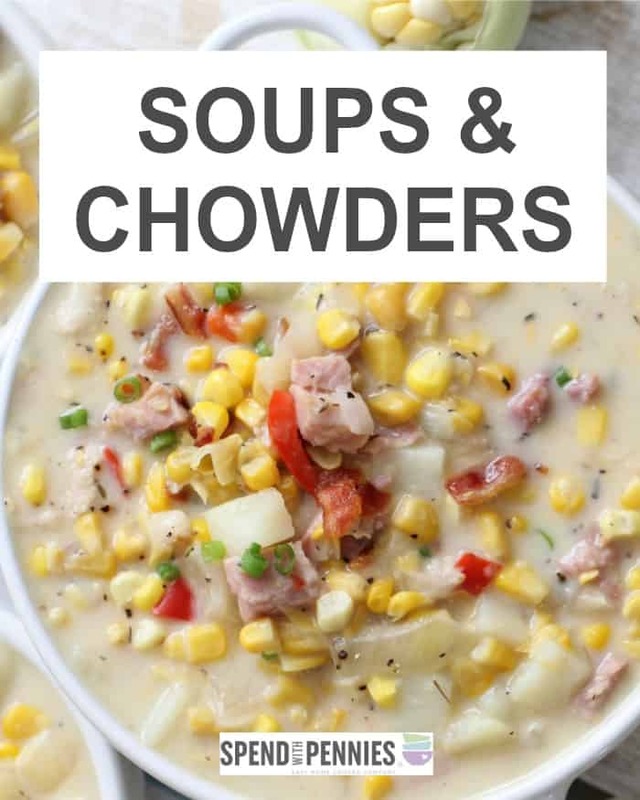 It pairs well with sweet veggies like corn and sweet potatoes and adds great flavor to cream or potato based soups! 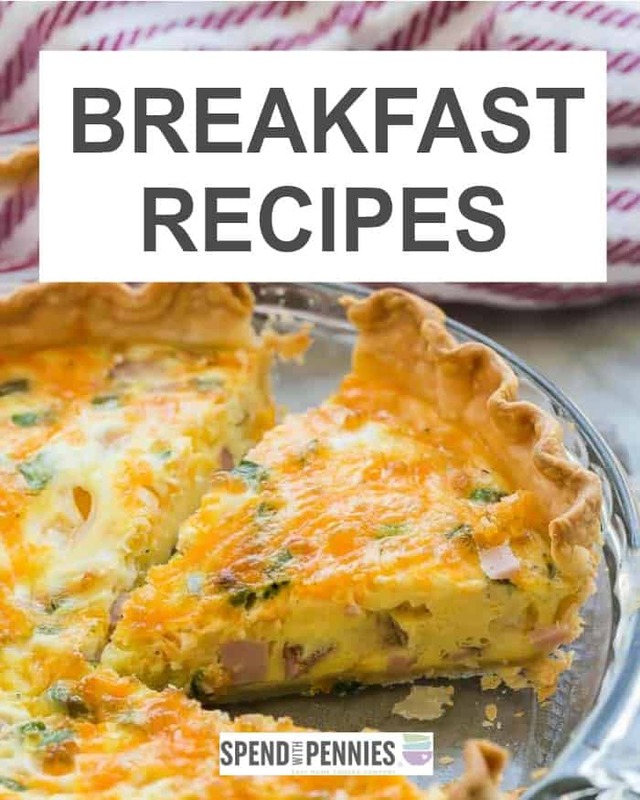 Ham is a great addition to breakfast recipes as it’s leaner than sausage or bacon and adds a delicious smoky flavor! Ham is such an easy protein to use so let your imagination guide you! You can use it in countless recipes to replace chicken or ground beef. 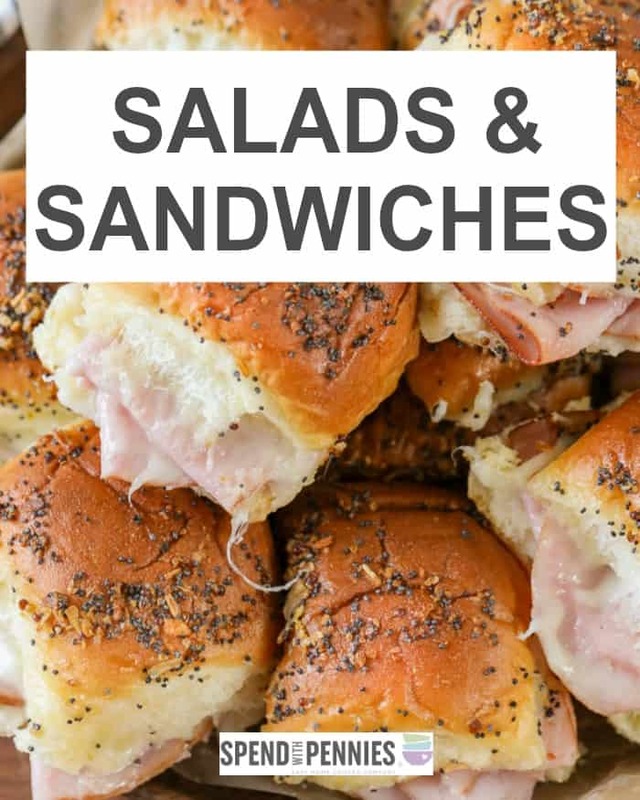 It also makes great sandwiches or is perfect for snacking on its own! Add it in place of chicken in a quick fried rice recipe! Diced leftover ham into small pieces and add it to cooked peas with butter. Add diced ham to scrambled eggs or omelettes. Replace the chicken in your favorite chicken pot pie recipe. Serve a simple ham sandwich by frying the ham and putting on toast with cheddar cheese and mustard. Top your favorite pizza dough with ham (or add it to a frozen pizza). Deck out your fave baked potatoes with butter, sour cream, cheddar and ham for an easy meal! Add ham and cheddar to homemade biscuits and serve warm with butter. Add ham to almost any pasta salad recipe or macaroni salad! This leftover ham hash is a way to have a meal in minutes and the great thing is that you can make it for breakfast, lunch or dinner! 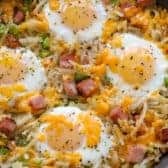 I use leftover potatoes if I have them or use store bought hash browns to make it extra quick! So easy! 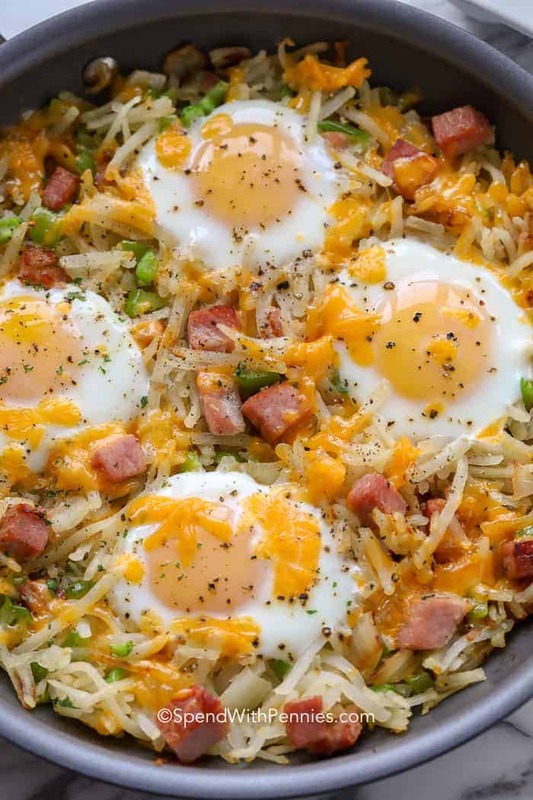 Tender potatoes and smoky ham make the perfect breakfast hash topped with eggs! Heat olive oil in an ovenproof skillet over medium heat. Add onion until onion is softened, about 5 minutes. Stir in hash browns, green pepper and ham. Cook until the the hashbrowns are lightly browned. Create 4 wells in the hash and break an egg into each hole. Season with salt and pepper and top with cheese. Bake for 12-15 minutes or until the eggs are cooked to your preference. Note, the eggs will continue to cook once removed from the oven so do not overcook. 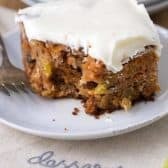 This really is the Best Carrot Cake and it is one of my most requested dessert recipes of all time. It’s quick, incredibly moist, and homemade. This cake fully loaded with pineapple, coconut, walnuts and raisins and all topped off with cream cheese frosting. 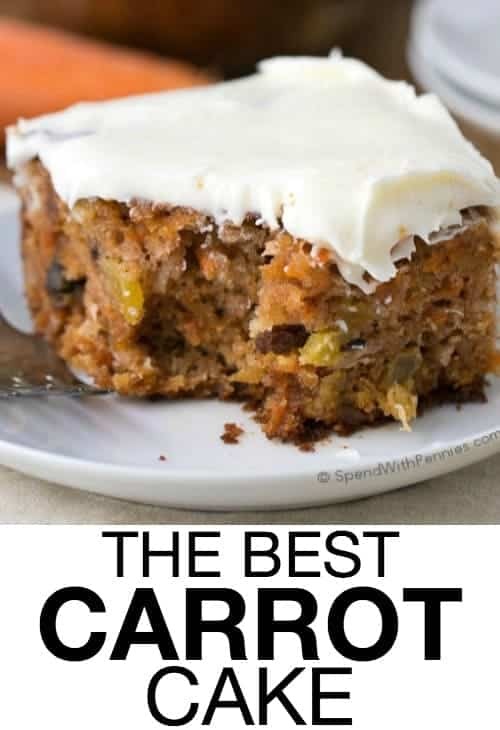 If you like carrot cake, you are going to love this easy, from scratch recipe! Carrot cake is a classic dessert that I think we’ve all enjoyed! 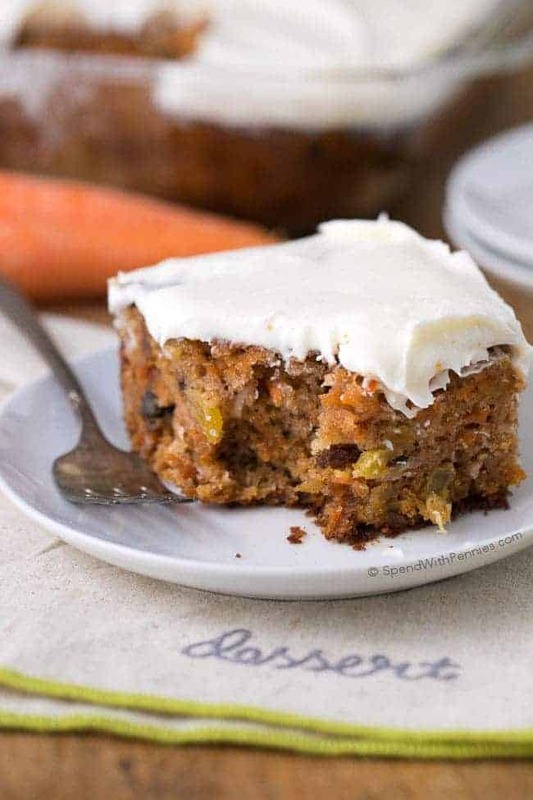 I have sampled and savored countless recipes over the years, and I think it is safe to say that today I am sharing The Best Carrot Cake Recipe ever! 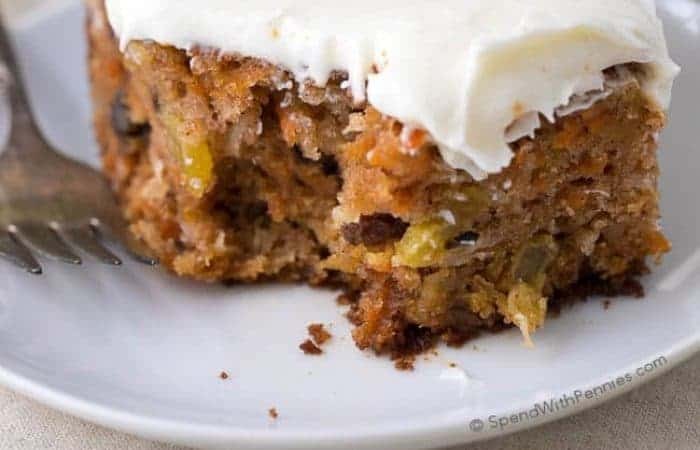 It seems to me there are two types of carrot cakes, the ones that are light and fluffy almost more like a spice cake with carrots and then there are the ones like this which are incredibly moist and fully loaded with goodies from nuts and pineapple to coconut and raisins. I personally prefer the latter! Everyone seems to have that one dessert they’re known for… this one (along with Caramel Chocolate Poke Cake) is a dessert I am asked for ALL of the time. 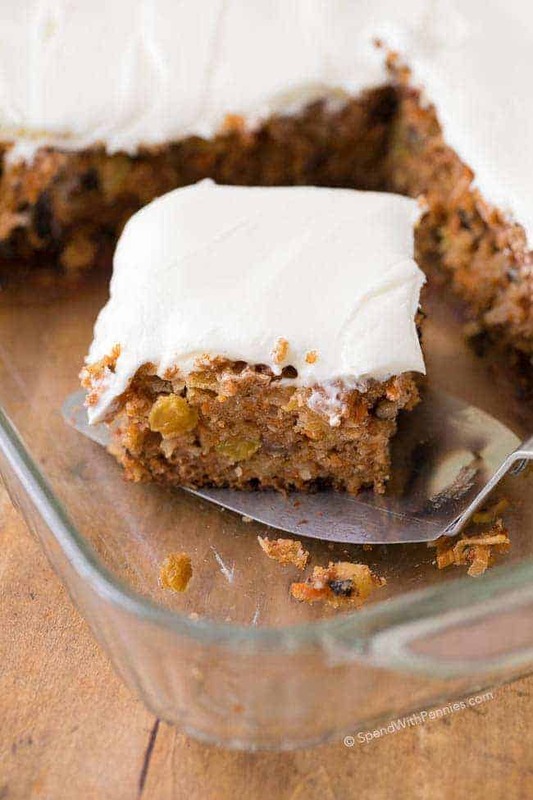 This easy homemade carrot cake recipe creates a rich cake that is packed full of goodies! It’s completely loaded with pineapple, coconut, walnuts and raisins and it’s impossible to mess up! I’ve made it literally a hundred times (and I think most of the times are for my friend Billy who loves this cake more than anyone else)! 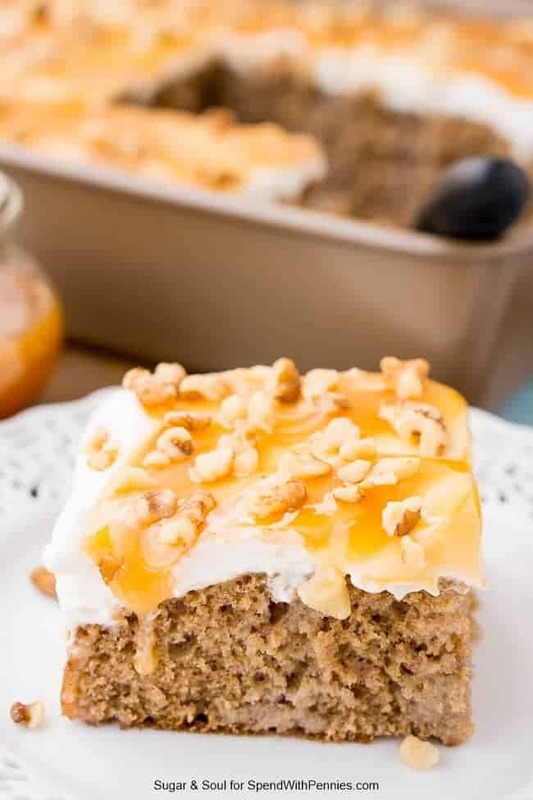 The walnuts in this cake add a nice nuttiness which is perfect with the cinnamon, you can certainly substitute pecans if you happen to have them on hand (but walnuts are my favorite in this recipe). 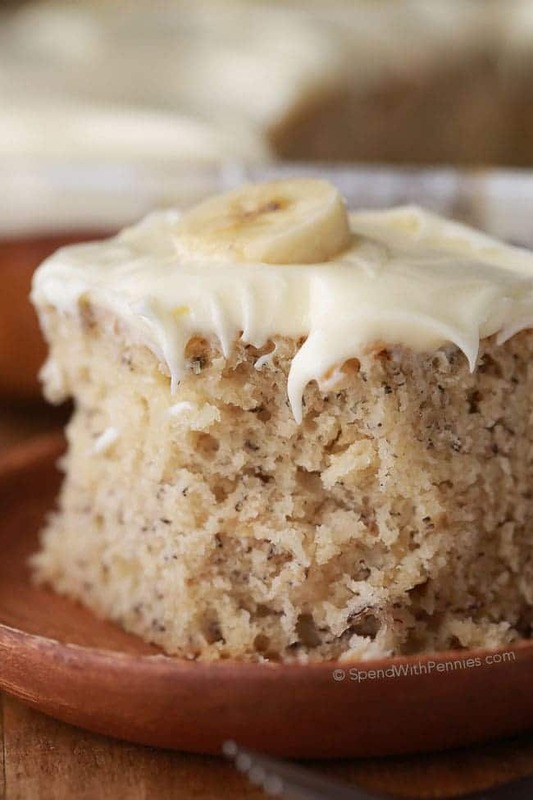 Making a cake with crushed pineapple makes it incredibly moist (just like adding zucchini or banana to a cake adds moisture)! I grate my carrots using the larger holes on my cheese grater. While a lot of carrot cakes are made in layers, those cakes tend to be a little bit lighter in texture and to be honest, I feel like making a layer cake is a bit too fussy for me. I prefer to bake cakes in a 9×13″ pan with a lid so that we can bake and serve (and even freeze) in the same dish. I find these types of cakes easiest to make and to store. In fact, this cake is so good and so moist, you really don’t need frosting but I personally LOVE a good homemade Cream Cheese Frosting on carrot cake. If you prefer, this is also amazing topped with whipped cream. 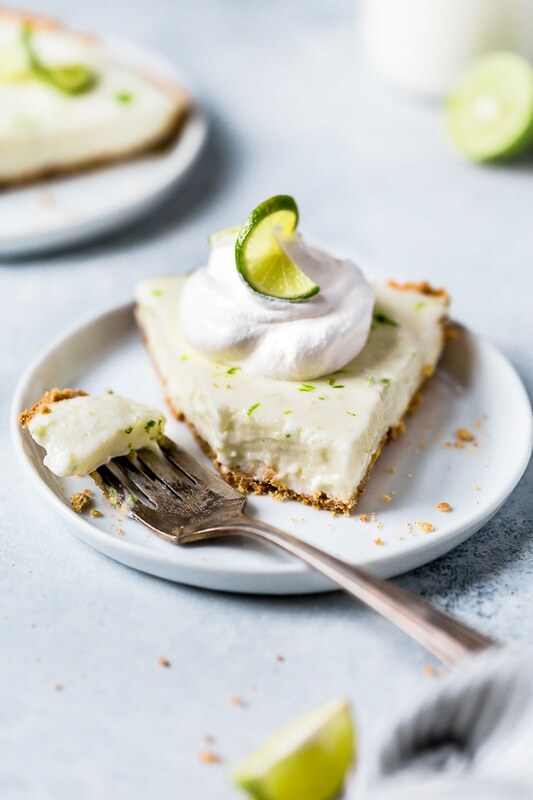 Regardless of how you serve it, this is one dessert that is always a crowd favorite so don’t count on having any leftovers! This cake is a deliciously rich cake and it’s very moist so I store it in the refrigerator for up to 5 days. It’s best if you bring it to room temperature for serving. Keep in mind that this freezes well, in case you want to bake now and savor later! Tres Leches Cake – Easy and delicious! Easy Apple Cake Recipe – with a cream cheese filling! Chocolate Chip Pumpkin Cake with Cream Cheese Frosting – So moist! Zucchini Cake – Family favorite! Simple Chocolate Cake – Simple & decadent! The Best Carrot Cake is one of my most requested dessert recipes of all time. It’s quick, incredibly moist, and homemade. Preheat oven to 350 degrees. Grease and flour a 9×13 pan. Combine flour, baking soda, salt and cinnamon with a whisk. Set aside. In a separate bowl, mix together eggs, buttermilk, applesauce, oil, sugar and vanilla. Stir in flour mixture just until mixed. 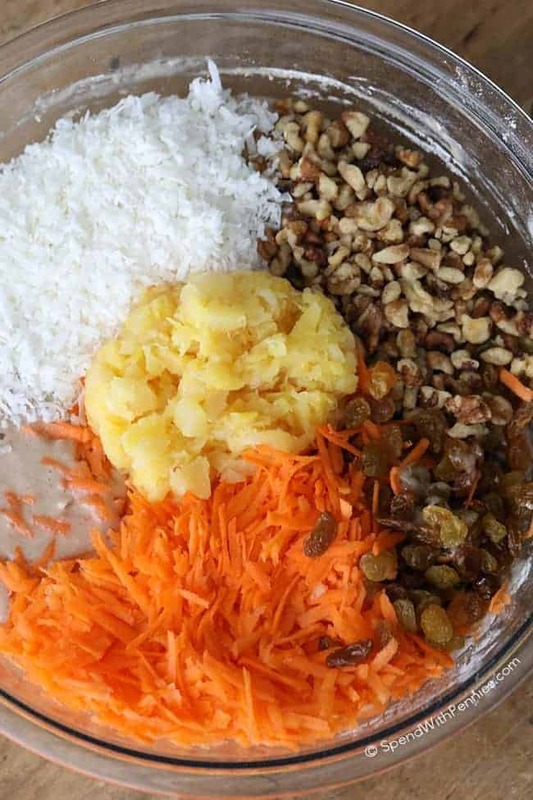 Add carrots, coconut, walnuts, pineapple and raisins and mix until combined. Pour into prepared pan for 55-65 minutes or until a toothpick comes out clean. Baked Chicken Legs are always a good choice for the budget-conscious household. This delicious recipe produces the most tender juicy meat with crisp skin for the perfect dinner. Since they’re so easy to make, they’re also great to bake and pull the meat for Homemade Chicken Spaghetti or Chicken Salad! I love serving these with a side of steamed broccoli and Easy Oven Roasted Potatoes for a healthy, easy weeknight meal! When it comes to finding ways to save money without sacrificing pure deliciousness, baked chicken leg quarters are on my short list. But cost is a very small part of the picture. Nothing compares to bone-in, skin on dark-meat poultry for juicy, tasty yumminess. Plus, it’s just about the fastest dish to prep that you can imagine. A simple seasoning of garlic powder and herbs is all you need (use fresh herbs if you have them on hand or use 1/3 the herbs if using dried). 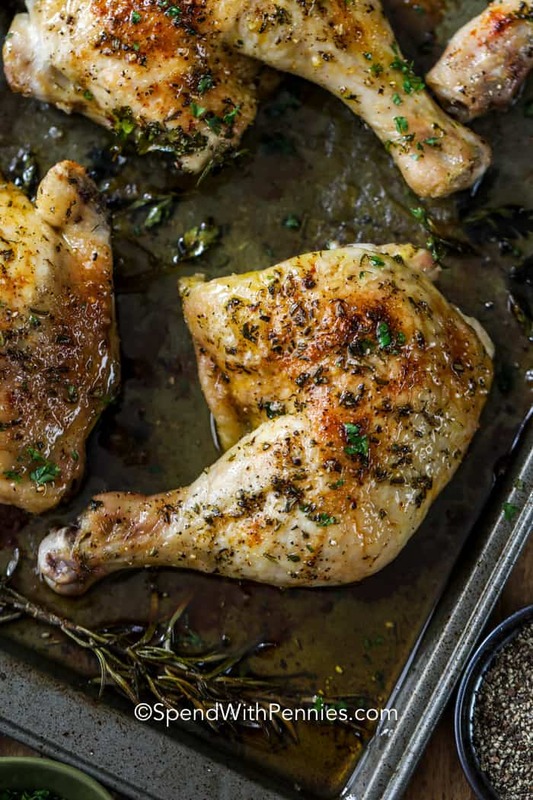 I love rosemary with poultry, and that’s what this baked chicken legs recipe calls for. But you can also make these just as easily, with nothing more than salt and freshly ground pepper (or turn them into baked bbq chicken legs with your favorite barbecue sauce). Chicken legs are a dark meat cut of chicken consisting of both a thigh and drumstick. 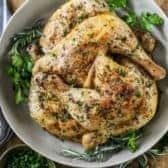 As much as I love a juicy Oven Baked Chicken Breast, I find that dark meat (including chicken thighs) carries so much more flavor. Keeping the skin on helps seal in the juices and it comes out crisp and delicious! Even if you decide not to eat the skin, I’d suggest cooking these chicken legs with the skin on. Cut away any large chunks of fat if desired (I usually don’t bother). Pat the chicken dry with paper towels to remove any excess moisture on the skin. 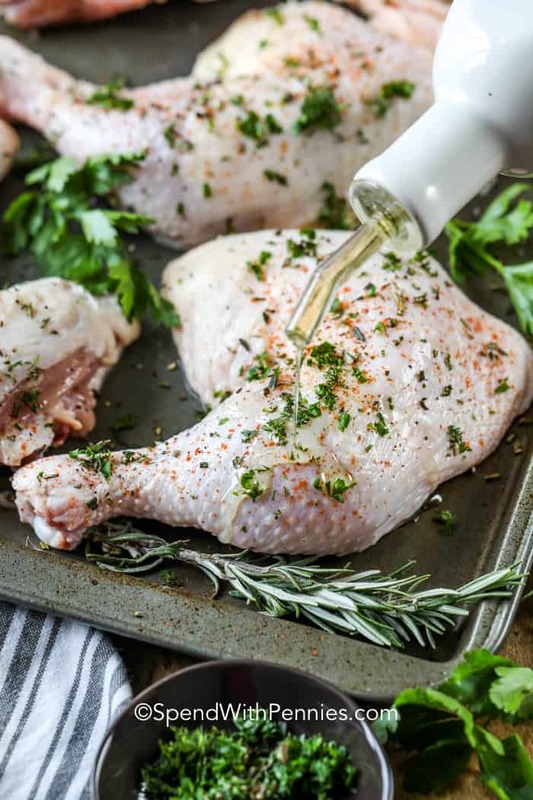 Toss the chicken legs with olive oil, garlic powder and herbs. Place on a rimmed baking sheet uncovered and bake until the juices run clear and a meat thermometer registers an internal temperature of 165°F. Broil 1-2 minutes at the end if desired. 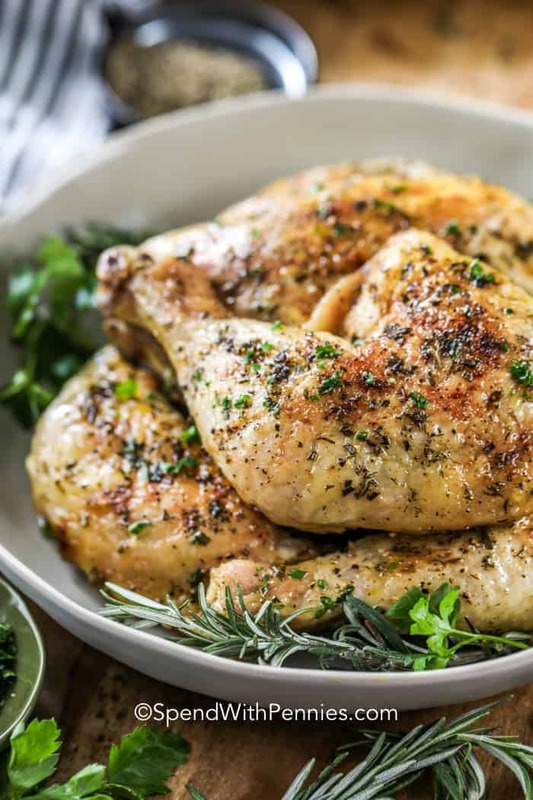 Serve your oven baked chicken legs with cheesy scalloped potatoes or roasted sweet potatoes, for a hearty and satisfying dinner. If you have leftovers, they’ll keep in the refrigerator for 3-4 days. Or, you can freeze them for up to four months. You need to be food-safe when it comes to any poultry or poultry product. 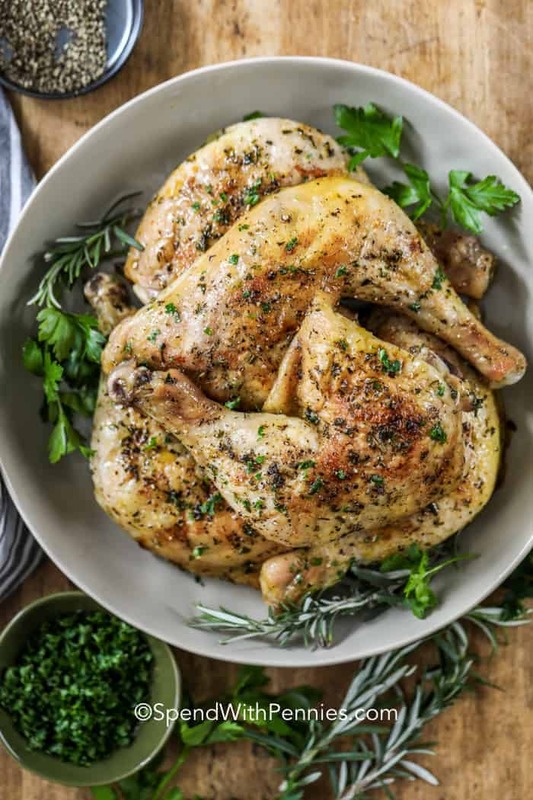 Cooking times will vary, depending on the oven temperature, whether the chicken starts at room temperature or is straight out of the refrigerator. Baked chicken legs should be cooked until the juices run clear and the internal temperature has reached 165°F. Always preheat your oven before putting the legs in. A higher temperature will produce a crisper skin. The best way to ensure doneness is to use a meat thermometer (I never cook meat without it). Make sure you don’t hit a bone while checking the temperature, or the reading will be off. Creamy Chicken Enchiladas – personal favorite! Baked chicken legs are always a good choice for the budget-conscious household. Toss chicken legs with olive oil, herbs, garlic powder and paprika. Season generously with salt and pepper. Bake 40-45 minutes or until juices run clear and chicken reaches 165°F. Broil 1 minute if desired. 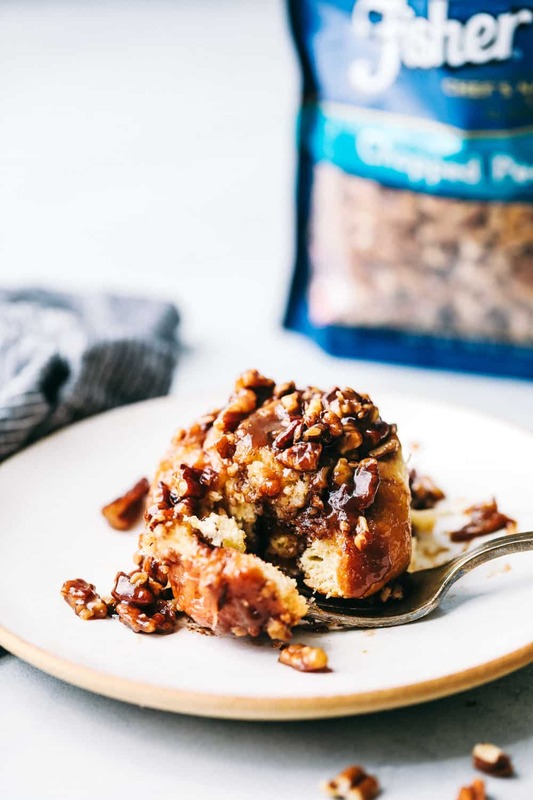 One Hour Caramel Pecan Sticky buns are ooey gooey sticky delicious! 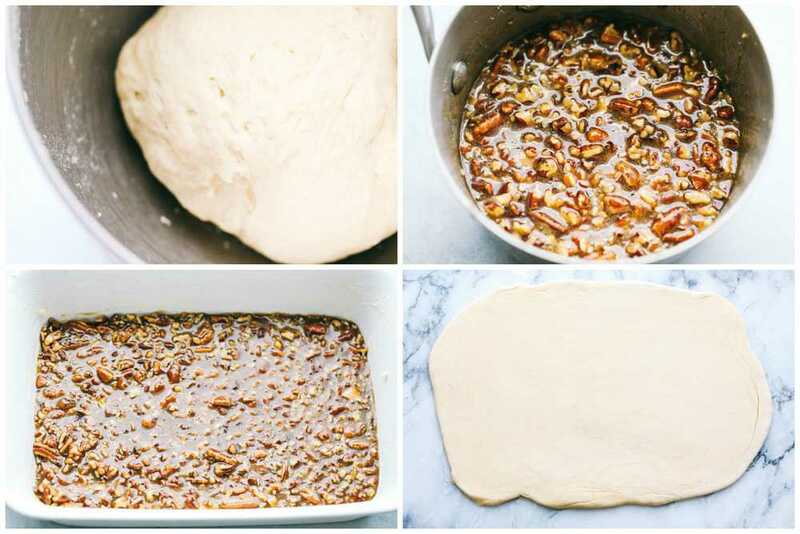 They are made with an easy dough from scratch and have the best caramel pecan sticky topping. The best part is they are ready in just an hour! Sticky Buns are always a classic Easter tradition that my family always loves to enjoy! 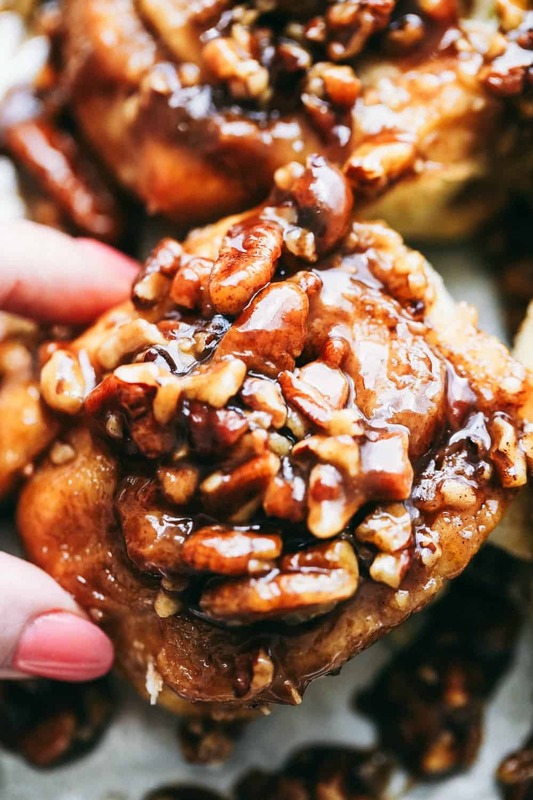 Is there anything better than warm sticky buns that are ooey gooey and coated in a caramel glaze? I don’t think so! This year, I wanted to do more with them and add more flavor, color and deliciousness to the buns. 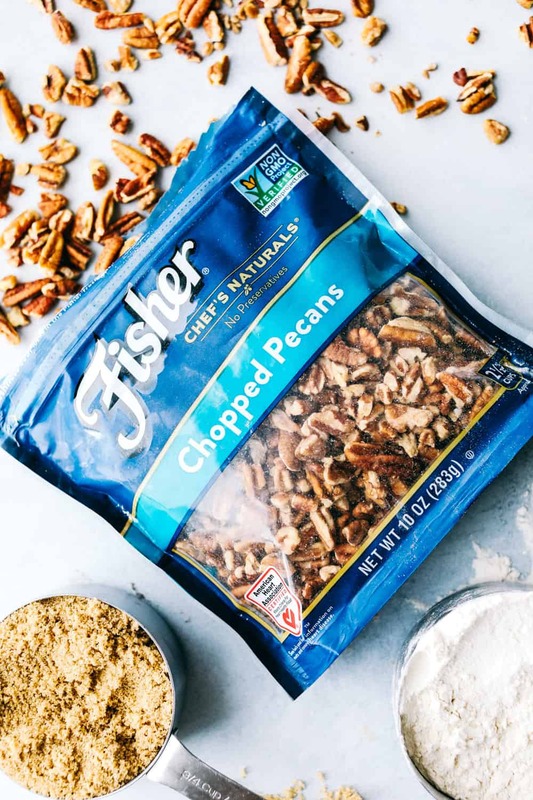 Fisher Nuts always has the best pecans and are my go-to to make the flavor pop in the recipe that I am creating. They help to bring new flavor and texture to the dish. Fisher nuts are right out of their shells, they have no preservatives and are non-GMO project verified. I can always trust to get amazing quality and flavor every time. I love the resealable stand up bag that helps to keep the pecans fresh and ready for when I need them. Almonds, Pecans, and Walnuts are the perfect addition to any spring recipe. 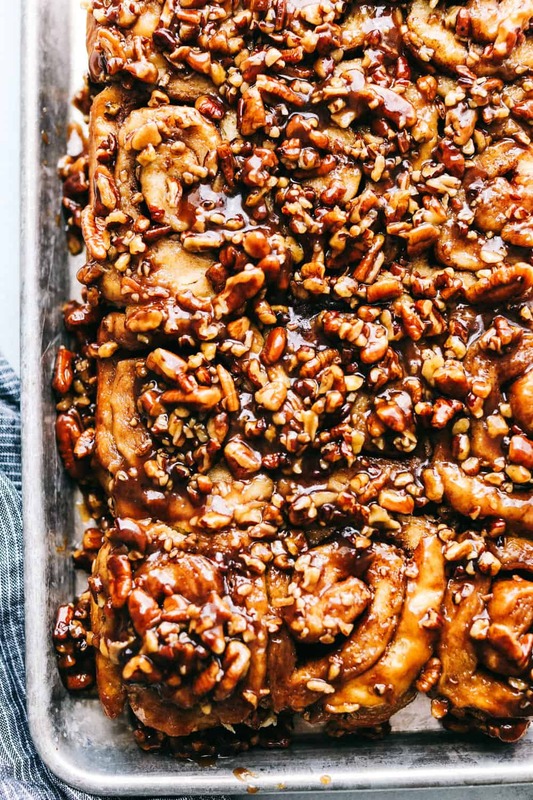 Adding the pecans with the caramel glaze made these Sticky Buns unforgettable. 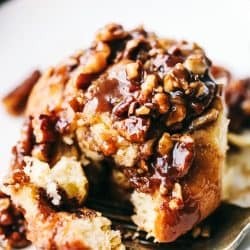 How Do You Make Sticky Buns? To make the dough: In a small saucepan over medium low heat add the milk and butter. Stir until the butter has melted and remove from heat. Let stand until luke warm temperature. In a large mixing bowl whisk together 2¼ cups flour, yeast, sugar, and salt. Add to the stand mixer with dough hook attached. (You can also make this by hand, just knead until smooth once all of the ingredients are added.) Add the egg and water and mix until just starting to combine. Slowly add in the milk mixture and 1 cup of flour until the dough starts to form and become smooth. Let the dough rest for 10 minutes. To make the caramel glaze: In a medium saucepan add the butter and melt over medium heat. Stir in the brown sugar, karo syrup, and heavy cream. Stir in the pecans. Spread the mixture into the bottom of your greased 9×13 inch pan. On a lightly floured surface, roll the dough into a large 9×15 square. About ¼-1/2 inch thick. To make the filling: In a small bowl combine the cinnamon, brown sugar, and melted butter. Spread evenly on the dough keeping it about 1/2 inch from the edges. Roll up the 15 inch side into a log and pinch the seams. Cut into 9-12 slices depending on how thick you want your cinnamon rolls. Place in a greased 9×13 inch pan and cover with a damp cloth and let rise for 15 minutes. Preheat oven to 375 degrees. Bake for 25 minutes or until just golden brown on the tops. What is the Difference Between a Sticky Bun and Cinnamon Roll? 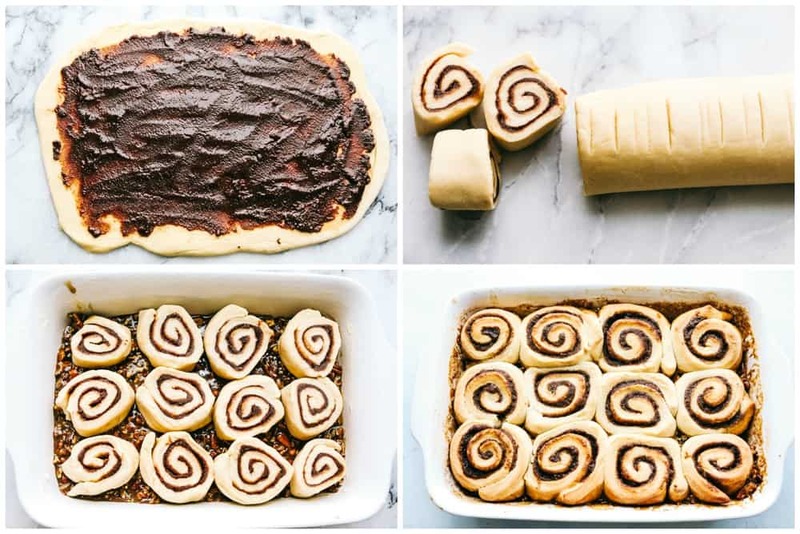 The main difference between sticky buns and cinnamon rolls is the topping. They are both known to be sweet rolls and are both filled with a butter, brown sugar and cinnamon filling. Cinnamon rolls are generally topped with a cream cheese, vanilla or almond icing glaze or frosting after they are baked and cooled. 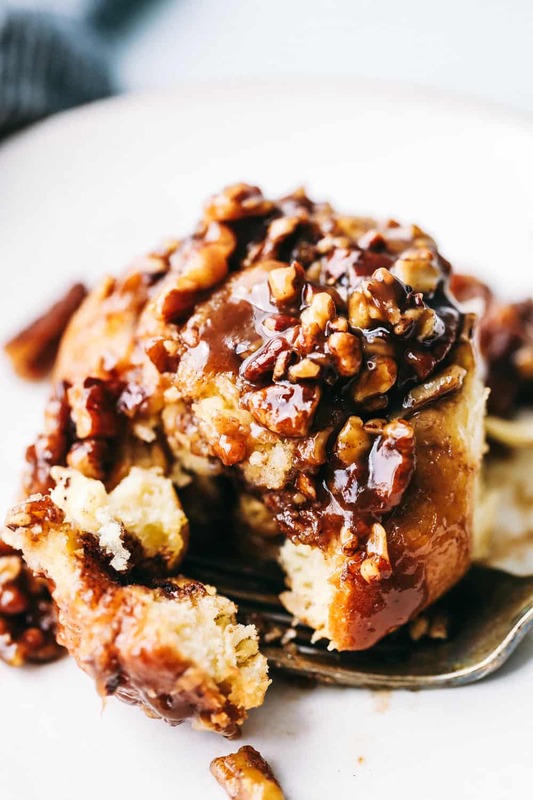 Sticky buns are traditionally topped with caramel and pecans or other nuts. The topping is added to the bottom of the baking dish then the rolls are baked on top of that. The Sticky Bun is the ultimate sweet roll! How Do You Store Sticky Buns? Sticky buns will keep at room temperature for about 2 days in an airtight container. They will also stay fresh in the refrigerator for about 1 week in an airtight container. Can You Freeze Sticky Buns? Yes! You can freeze baked buns up to 2 to 3 months. You will want to wrap them with foil prior to placing them in an airtight container for freezing. When ready to eat, thaw them overnight in the refrigerator, then warm them up in the oven or microwave and enjoy! Yes! Cinnamon roll dough can be refrigerated either after it is kneaded and before the first rise or after the dough has risen and is shaped. Cover the shaped dough tightly and refrigerate up to 24 hours. When ready to bake, remove from the refrigerator, partially unwrap and let rise until doubled. Where Do Pecans Come From? “Pecan” comes from the Native American word “paccan,” which means a nut with a shell so hard it must be cracked with a stone. Indigenous to the South Central U.S. and Northern Mexico, Pecans are one of the newest domesticated major crops, with commercial production beginning in the 1880s. Today, consumers enjoy more than 500 varieties of this delicious, flavorful nut, both as a snack and an ingredient in cooking and baking recipes. Are Pecans Good For You? See nutrition information on package for fat content. Looking for more delicious recipes made with Fisher Nuts? Look no further! This post was sponsored by Fisher Nuts. All opinions expressed are my own. I love supporting brands that I use in the kitchen for myself. CrockPot Chicken Tacos are an easy family favorite meal! 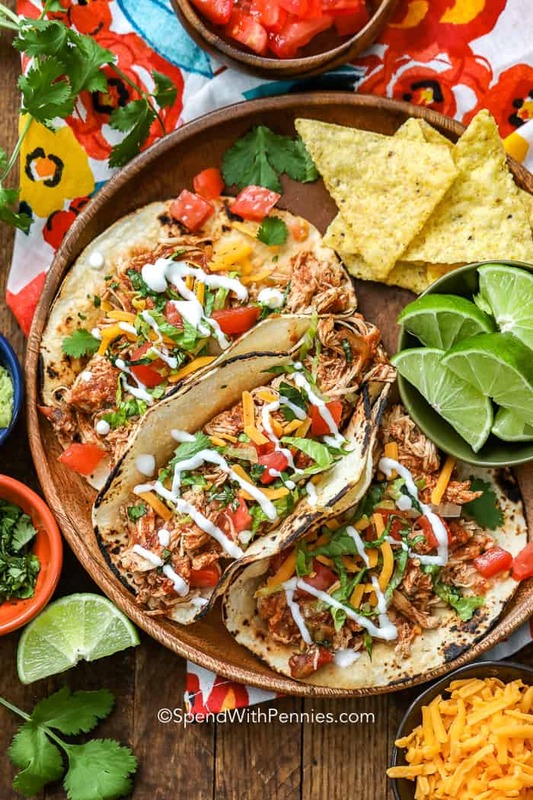 A handful of ingredients tossed into the slow cooker makes the most tender flavorful chicken for tacos (or for Chicken Enchiladas, burritos, loaded nachos and more)! Add chicken breasts, salsa, tomatoes and seasoning and let the slow cooker do all of the work. Before serving shred the chicken and enjoy! It’s that easy! Taco nights just got easier! 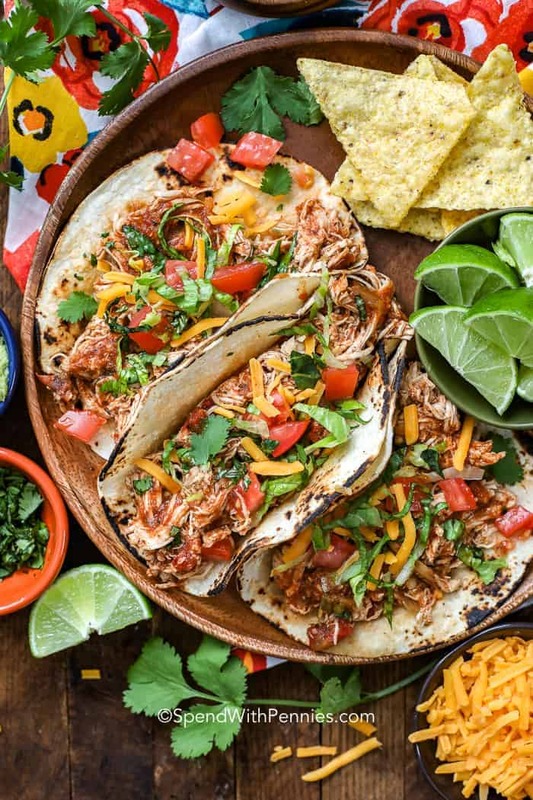 These Crockpot Chicken Tacos are such a snap to put together and always come out amazing! Tender shredded chicken is perfect added to tacos, burritos, salads and more. 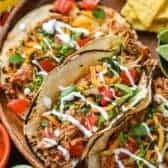 Swap out the ground beef to make an amazing taco salad or add this flavorful shredded chicken to wraps, casseroles or soups. I have to tell you that this is one of those recipes that my whole family truly loves! Simply place the ingredients in the crock pot and walk away. To season the chicken for tacos, I use … you guessed it, taco seasoning! I prefer homemade taco seasoning in this recipe to control the salt but a packet will work just fine as well. While the ingredients call for boneless chicken breasts, you can certainly use bone in chicken as well (just make sure it’s skinless). 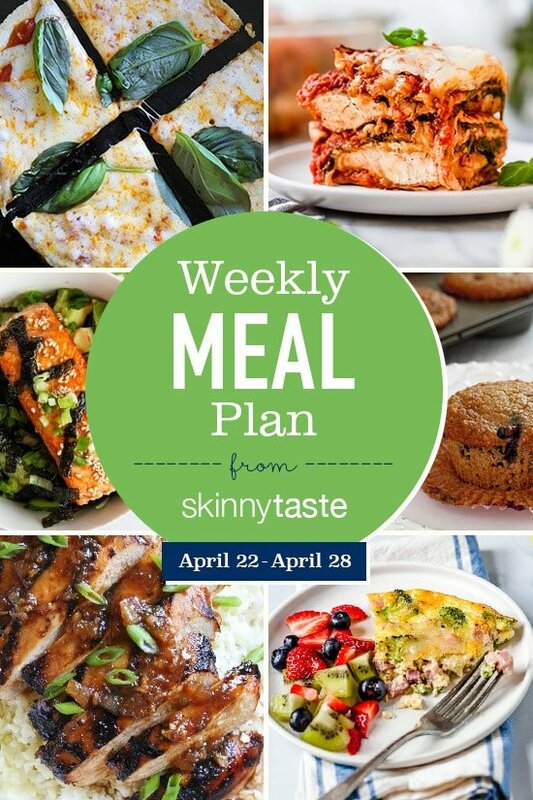 Once shredded, this freezes perfectly making for a super fast weeknight dinner! I’ve used this for making chicken tacos, chicken salads and even spicy chicken pizzas! Pile on your favorite toppings for a fabulous dinner loaded with flavor! Shrimp Tacos – Weeknight favorite! Taco Soup – So easy and so much flavor! 5 Minute Taco Dip – Perfect last minute party dip! Taco nights just got easier! 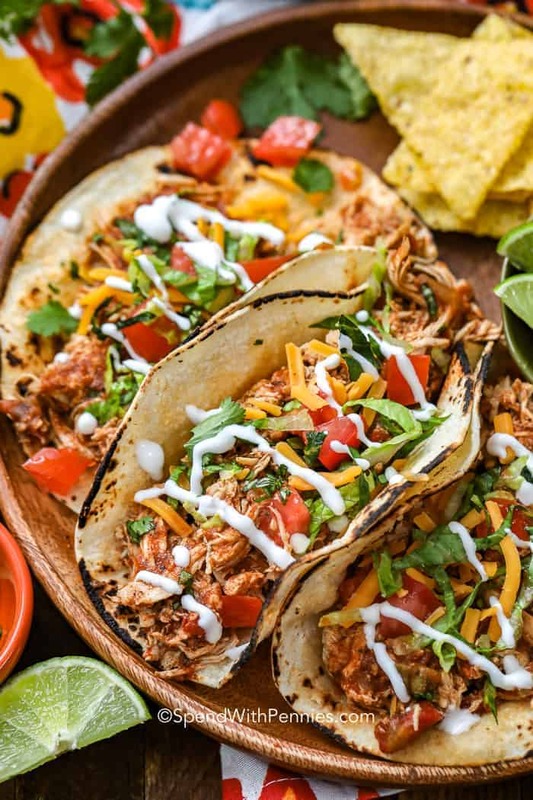 These Crockpot Chicken Tacos are such a snap to put together and always come out amazing! Combine salsa, canned tomatoes, and taco seasoning. 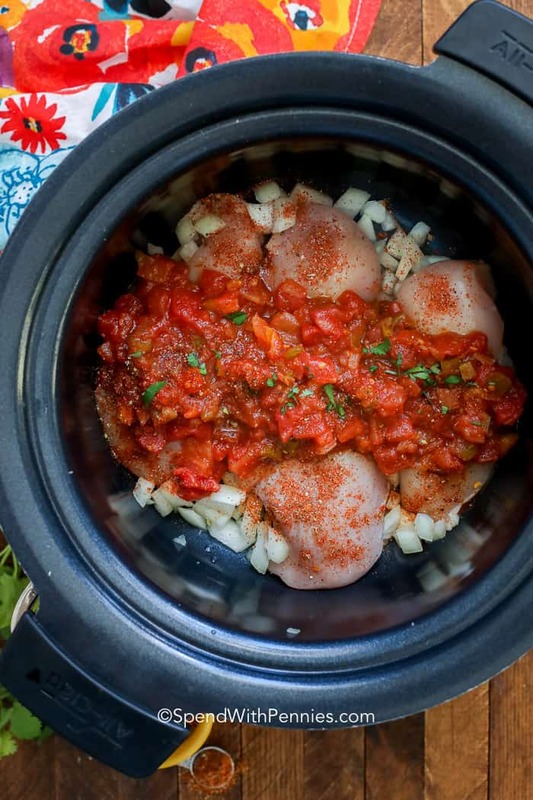 Place onions & chicken in the slow cooker and top with tomato mixture. Remove chicken from slow cooker and shred. Return to slow cooker and stir in juices. Serve in taco shells, on salads, pizzas or in bowls over rice! If you prefer you can skip the canned tomatoes and add 1 1/2 cups salsa. Nutritional information does not include taco shell or toppings. 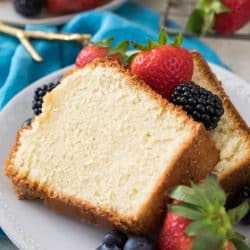 This Cream Cheese Pound Cake is a tender, moist, and flavorful dessert that’s a new spin on traditional pound cake! This recipe is simple to make! Top it off with whipped cream and fresh berries or enjoy plain! Pound cake is a simple and versatile classic, but have you ever tried cream cheese pound cake before? This simple addition gives this pound cake a soft, tender crumb that absolutely melts in your mouth. Make sure to print this staple recipe and save it with your other cake favorites like Tres Leches Cake, Marble Bundt Cake, and Strawberry Pound Cake! Hey everyone! Sam here from Sugar Spun Run with yet another sweet dessert! Today I’m showing you how to make one of the best pound cakes I ever tasted, all thanks to a secret ingredient: cream cheese! 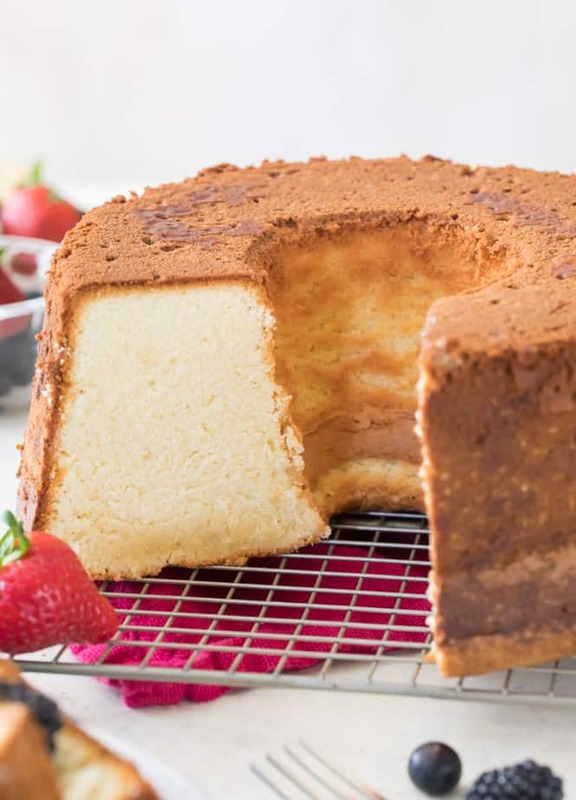 I love baking with cream cheese (my cheesecake recipe is one of my most used ever) and knew it would be a great way to elevate classic pound cake to the next level. This cream cheese pound cake has a soft, tender crumb and absolutely melts in your mouth. It’s easy to make with just a handful of ingredients and is based off of my own popular pound cake recipe. Let’s get right to it! Use a stand mixer or an electric mixer to beat together softened butter and cream cheese until creamy and well-combined. Beat in sugar until mixture is light and fluffy. In a separate bowl, combine your eggs and egg yolks (you’ll need a total of a dozen eggs, but you’ll only be using 6 whole eggs and 6 egg yolks — discard the remaining egg whites or save them to use in an angel food cake) as well as your vanilla extract and salt. Use a fork or whisk to lightly beat until the eggs are lightly scrambled. With mixer on low speed, gradually pour egg mixture into butter/cream cheese mixture. Stir well until well combined; make sure everything is thoroughly incorporated! Gradually stir in flour (again, it’s so important to make sure all ingredients are well combined) and stir well. Pour evenly into a well greased and floured tube pan or bundt pan and bake until cooked through. Allow to cool before serving and enjoying. 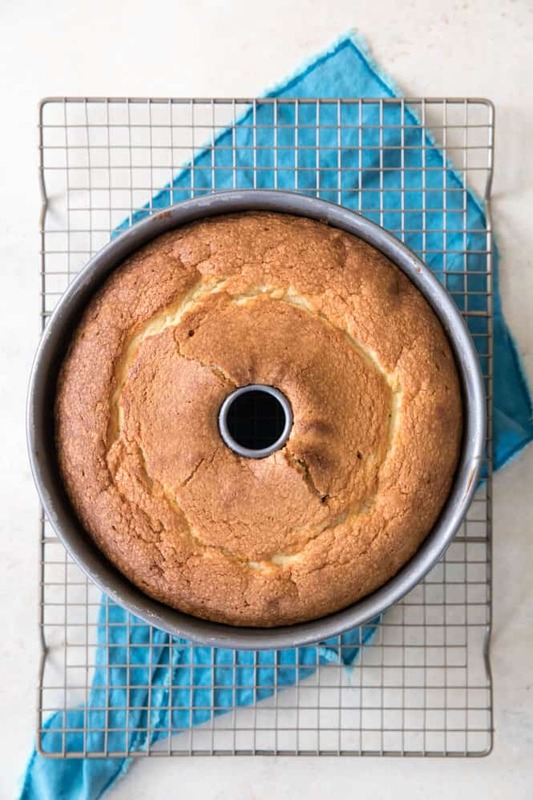 How Can I Tell if My Cream Cheese Pound Cake is Finished Baking? It can be tricky to tell if your cream cheese pound cake is finished baking simply because the cake is so thick. The best way to test is to use a long wooden skewer (a toothpick is simply too short and won’t cut it here). Insert the skewer into the thickest part of the cream cheese pound cake. It should come out with a few moist crumbs (but no wet batter). If the skewer comes out completely clean, the cake is definitely finished baking. Take it out of the oven at once before it can over-bake. If this cake bakes for too long it may end up dry. Can I Freeze Cream Cheese Pound Cake? Yes! Cream cheese pound cake actually freezes very well. Let the cake cool completely after it’s finished baking then wrap very well in plastic wrap. I also recommend then wrapping the cake in foil, just to be sure it’s well covered. 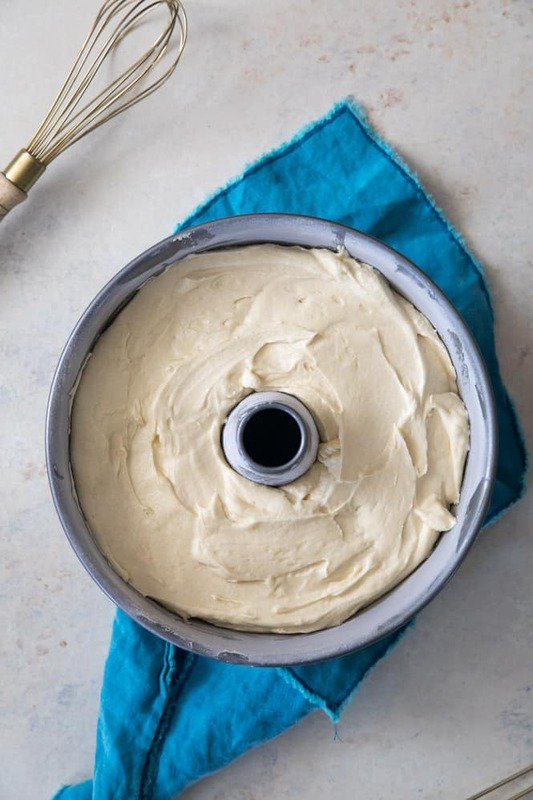 You may also slice the cake and individually freeze the slices (they’ll thaw much quicker this way) but it’s very important that you make sure that the cream cheese pound cake is carefully and completely wrapped up. For best taste and texture, serve cream cheese pound cake within 3 months of freezing. Why Is it Called “Pound Cake”? Traditional pound cake was made with a pound of butter, sugar, eggs, and flour. We’re making a few variations here (mainly the addition of cream cheese), but the name sticks! Want More Great Cream Cheese Recipes? 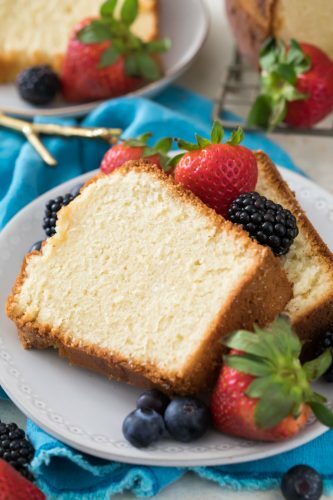 This Cream Cheese Pound Cake is a tender, moist, and flavorful dessert that’s a new spin on traditional pound cake! This recipe is simple to make! Preheat oven to 350F and generously grease and flour a tube pan (or bundt pan). Tap out any excess flour. 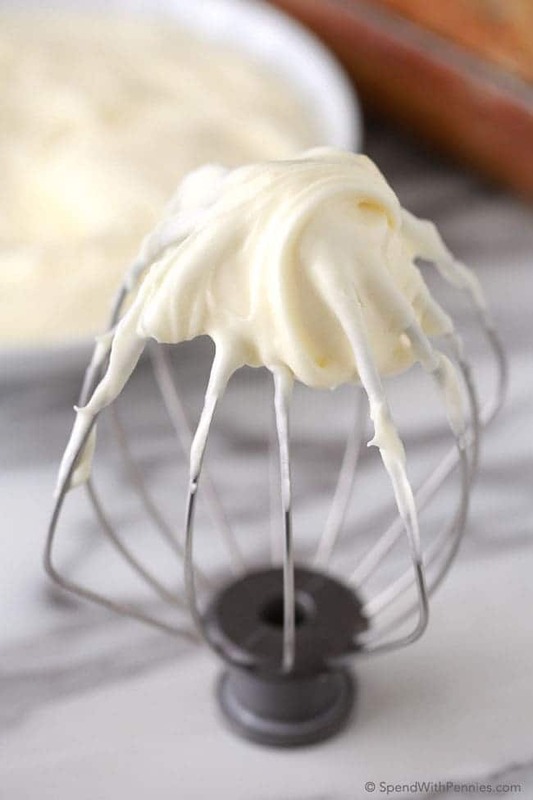 Using a stand mixer or an electric mixer, cream together softened butter and cream cheese. Scrape sides and bottom of bowl. Add sugar and beat until well combined and fluffy (about 1 minute on medium-high speed). In a separate bowl, combine 6 eggs, 6 egg yolks, vanilla extract and salt. Use a whisk to gently beat until combined and yolks are broken up. With mixer on low speed, gradually pour egg mixture into butter mixture until completely combined. Increase speed to medium-high and beat another 1-2 mins. Be sure to pause to scrape the sides and bottom of bowl. Gradually, about ⅓ cup at a time, add flour until completely combined. Scrape sides and bottom of bowl and stir again for another 30 seconds. It’s very important the batter is well-combined. Bake in 350F oven for 65-70 minutes or until a wooden skewer inserted in the center comes out clean or with a few moist crumbs. ¹You will need a total of 12 eggs but you will only be using 6 whole eggs (whites and yolks) plus 6 egg yolks. You will be discarding 6 of the egg whites.